Last week I scored a second hand MOTU 828 mkII external soundcard for just €100. The reason why the seller wanted to part from the unit for such a low price was a “broken screen”. Initially I thought that the whole screen was broken, as in not displaying any info at all. But coming home and plugging it in, I noticed the screen still worked, but it had no backlight. 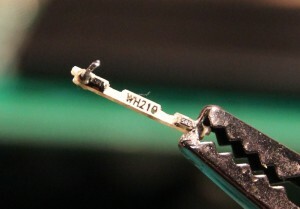 Googling for “motu 828 mkii fix screen” lands you on this Word file, posted in a Gearslutz topic, with pictures describing how to disassemble the MOTU and replace the broken LED. In case the file gets removed, I’ve saved a copy on this website. 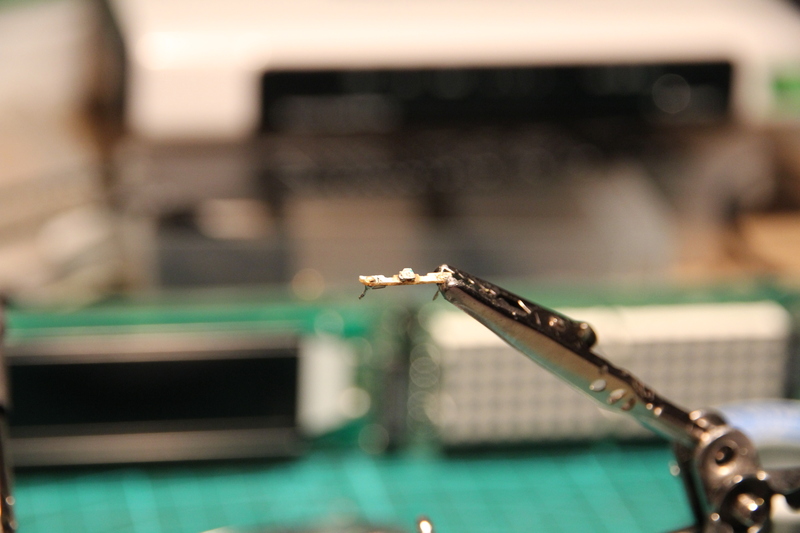 They desolder the old smd LED assembly and push in what looks to be a 5 mm LED. 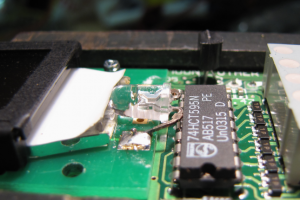 This is how the broken display backlight is fixed in the Word file on Gearslutz (image taken from that file). It will work, but I think it’s not the most elegant solution. First of all, one should always have a resistor in series when powering an LED. An LED is a diode and should be current limited. 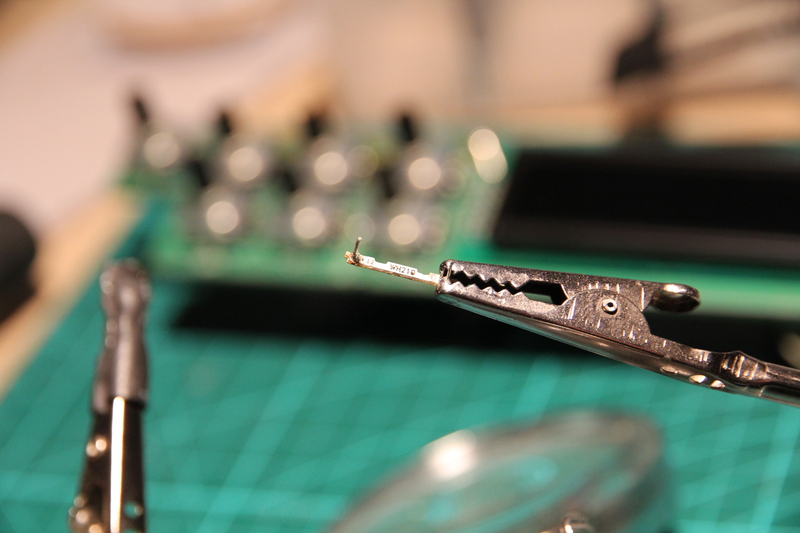 I also decided to use an smd LED instead of a big one, and reuse the current LED assembly to have a clean fix. So having removed the assembly, this is what it looks like. 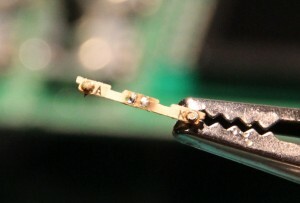 The LED assembly removed from the display, following the instructions in the Word file. The back of the assembly, with a resistor labeled 5R6, so 5.6 Ohm, and another component I couldn’t identify. Notice the brown burned out LED. On one side we have an smd resistor reading ‘5R6’, so 5.6 Ohm. 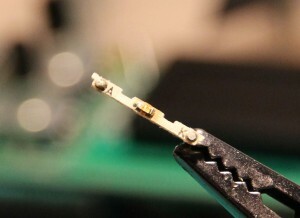 On the other side there’s another smd component in parallel with the LED. I can’t read the markings, so no idea what it is for. I can’t possibly think which other component would be required to drive an LED. 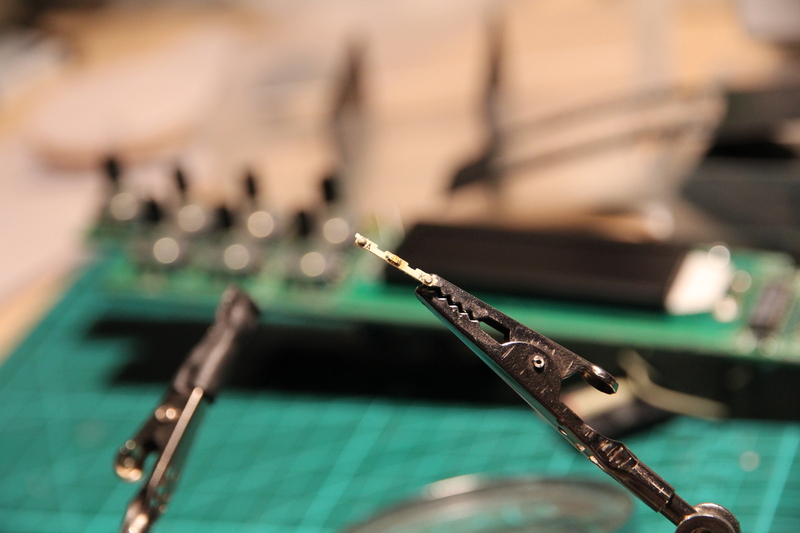 First I desoldered all components. The LED has been removed. 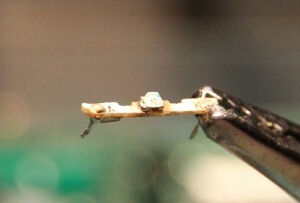 On the back side the resistor and the other component has been removed. Next I added a red 0603 smd LED and a 68 Ohm smd resistor (see EDIT 1 below). 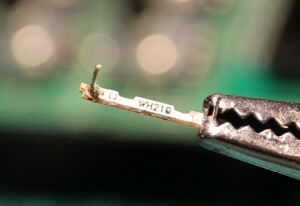 The resistor value was chosen measuring the voltage coming from the two wires at the back of the display. They provide about 1.4v. 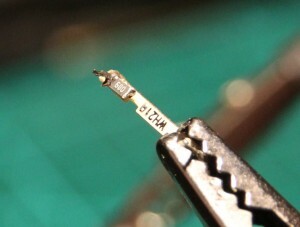 A red smd LED requires about 20 mA, so 1.4/0.02=70 Ohm. This also explains why the previous LED burned: 1.4/5.6=250 mA, more than 10 times the normal current. The new LED is in place. 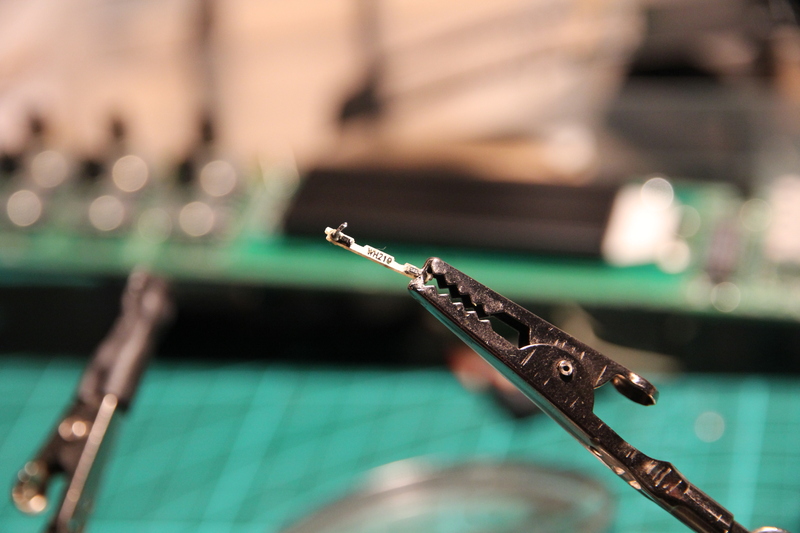 Keep in mind to solder the resistor to the correct contacts, the ones in series with the LED. A red smd LED typically requires 2.2v, so with 1.4v it won’t have full brightness, but the result turned out fine. 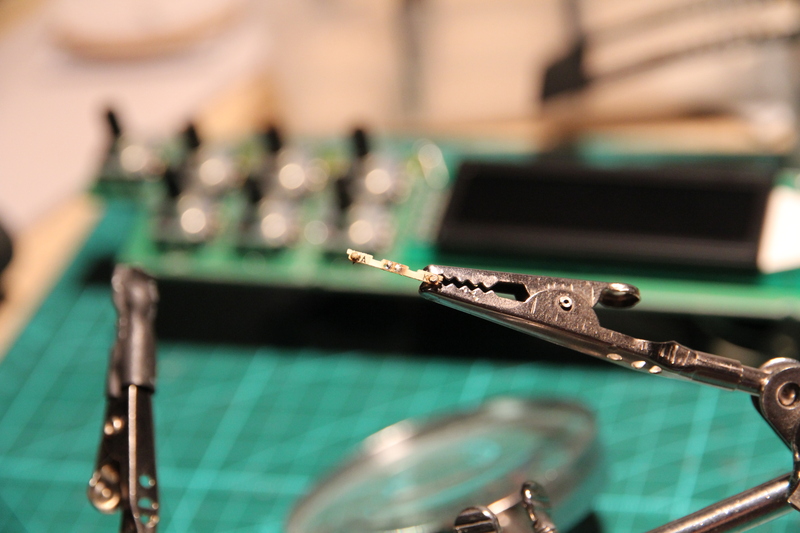 The LED assembly has been reinstalled and soldered. Mind the polarity! Now that’s a clean fix! Everything put together and working! The reason why I bought this soundcard is mainly because of its ADAT ports. I want to use them with Expert Sleepers ES-3 and ES-6 modules in a modular synth yet to be started, but that will be a whole other story. 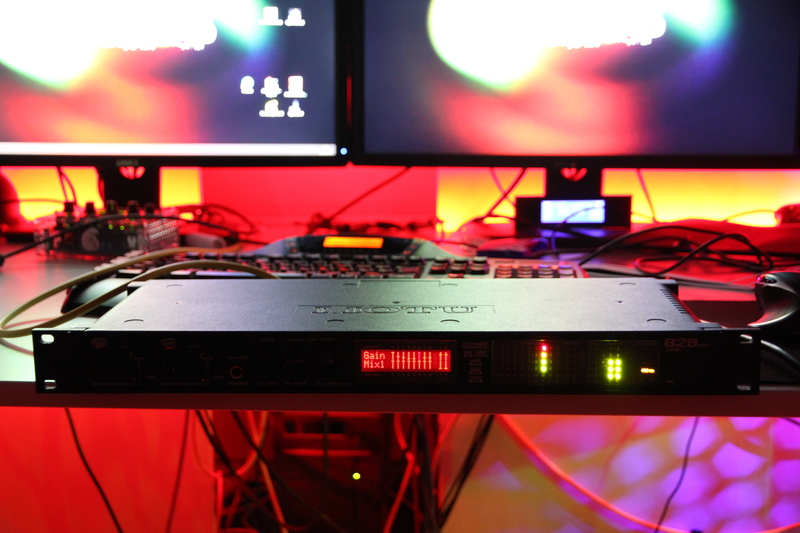 EDIT 1 (05-Apr-2016): Reading through a forum thread that links to this page, I saw there is some confusion why I chose a red LED, not a green one. If you look up the typical voltage required by a 0603 SMD LED at 20 mA, you’ll find that for a red LED it’s 2.1V and for a green one 3.2V. The luminous intensity at those voltages and current are 450 mcd and 350 mcd. Now bear in mind that the voltage to the LED is only 1.4V, which is below the typical voltage for both colors! In order to have the best brightness, I chose a red LED. The typical voltage of 2.1V to drive a red LED is closer to the 1.4V provided, than the 3.2V for a green LED. If you choose to take a green LED anyway, the resistor value can stay the same, because also for the green LED you stay well below the typical voltage. Only if the supplied voltage was for example 5V, you would have had to take it into account. After scratching my head a while, I just realised that with a 12V supply, my changing the onboard resistor from 7R5 to 8R2 would have made almost no difference to the current through the LED. I failed to mention before that I noticed a 220 Ohm 1W resistor on the main board which is connected in-line with the supply to the backlight feed wires. This is most likely the main current reducing resistor for the LED. I suspect therefore that the extra components on the backlight pcb are a reverse diode and accompanying inline resistor connected across the LED. 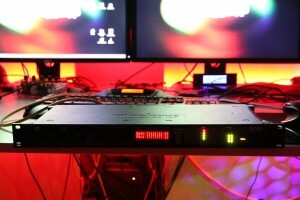 This arrangement is typically used to protect the LED in case the supply wires are reversed. Also note – this is also why the original idea of discarding the backlight pcb and replacing it with just an LED works fine as well as the current reducing resistor is still in circuit on the main board. Many thanks for your wonderful post. I managed to repair the backlight in an 828 mkii which was given to me for free! with your help!! One thing to note – The off-load voltage to the led PCB is actually around -12V. I believe the 1.4V you measured would have been with the damaged LED still in circuit which was probably dragging the supply down. I measured 2.2V with my damaged LED. For this reason I was able to refit a blue LED which when in circuit brought the supply down to the forward voltage level of 3.4V as expected. Also my original inline resistor value was 7R5 Ohms which I increased still further to the next preferred value of 8R2 Ohms in hope of easing the strain on the new LED. It still looks plenty bright enough to me. Thanks for the nice description! I just fixed my 828 mkII using this guide (combined with the original Word document). I left both driver components on the PCB and used a green 0603 LED from Everlight as replacement. The backlight now works but is very dim. Should probably have done some calculations before to get the right current for my replacement LED. The LED on my unit looked completely different from yours. The housing was completely transparant and it was embedded in some kind of transparrent rubber. 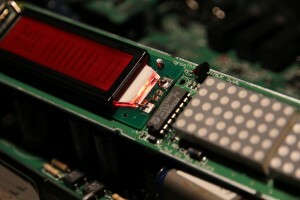 The unknown komponent on teh PCB was marked “C1”. After some research and measurements I concluted that it’s most likely a Zener diode connected in parallell with the LED. Don’t know enough about LED deriver circuitery to tell if it makes any sense or not.